Autobiographies have been my favorite genre for a long time. More so if the story is more of a general recount of happenings during a particular stint rather than a history of the entire life of an individual. 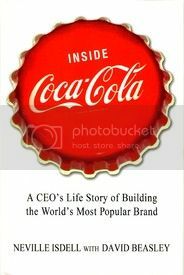 Inside Coca-Cola: A CEO’s life story of building the world’s most popular brand, By Neville Isdell perfectly fits the bill for this. Neville Isdell was a key player at Coca-Cola for more than 30 years, retiring in 2009 as CEO after rejuvenating the tarnished image of the world’s most popular brand – Coca-Cola. The book details and extraordinary personal and professional story crisscrossing from South Africa to Australia, and From Philippines to Atlanta. Neville managed to put out huge public relations fires, opened up new markets, groomed his successor and all this while furthering the cause of corporate social responsibility. From the start I remained glued to completing the book, and some stories stand out. The story of Coke’s return to India in 1993 and the eventual backlash from the consumers in accusation of killing Thums Up gives a good perspective of the real happenings. Also the story of Coca Cola turnaround in Philippines is truly inspiring. It goes on showing how understanding the local emotion and culture helped the company take over its competitor (Imitator as it is mentioned in the book), and how hiring a local person saved the company huge cultural mistakes. This gives a good insight to the strategies in play within huge companies. The book also dwells good light on Neville’s personal life. Neville sure belonged to that rare breed of people who knows how to work his way through no matter what comes in the way. This book is not about branding or marketing strategies of the brand, but a memoir of the strategies used under different situations the author has been. This book would help open your mind to what the world has to offer if you are game for it. The book, in my opinion, is more enjoyable reading it keeping Coca Cola as a company as its main lead rather than Neville. As a last note, the book surely leaves you with a lot of working tactics in the business atmosphere, but could have been stitched in a better manner.